These are maps from a re-issue of a travellers atlas dated around 1794. Format of the maps is 12.5 by 9.5 cm. Great post Vonkla! Could you please post the name of the atlas you have taken these images from? Are you sure it is from 1794 and not earlier? Cartography was a lot more advanced by then. Wao, will study minutely. Brilliant share. From one of the US Universities map collection. I didnt know there was so much interest in Historical maps. The Perry-castaneda collection of ancient maps in the University of Texas Library site may be accessed here: http://www.lib.utexas.edu/maps/historical/history_asia.html. It covers India from 1700-1792, amongst many others. I mentioned it briefly in the Srirangam trip report. Yes, UT collection is remarkable. There are also some niche collections in other universties too; but nothing like UTs. In fact the PC collection were amongst the first rich resource put up by a university. It started with gopher, and then switched to web. It is quite rich indeed. Came in handy when I was reading The return of a King - William Dalrymple. There're afghan city maps (during the Anglo-Afghan wars) therein, also Iwo Jima !! The facsimile edition is from 1994, ISBN 90 72 770 53 6. The Atlas was original published in 1794, the dates of the individual maps are unclear. The maps are late 17th century. They show the provinces of the Mughal Empire under Aurangzeb. Forts St. George and St. David exist but Calcutta doesn't. No sign yet of the Marathas. 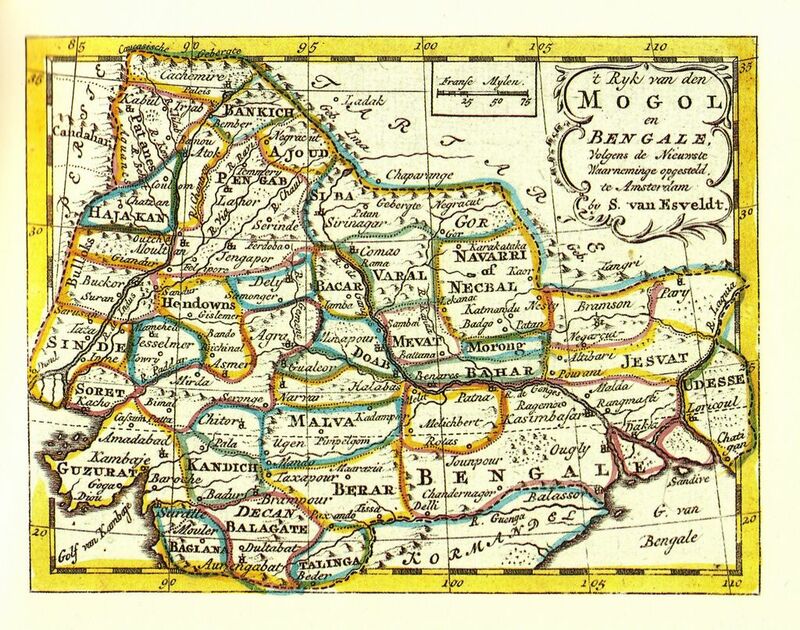 The upper map is entitled 't Ryk van den MOGOL en BENGALE. Of course there are a lot of inaccuracies but then there is a lot of interesting detail too, e.g. the NAVARRI of NECBAL around Katmandu. No sign of the Gurkhas there. I have a feeling that the two maps (North India and South India) aren't contemporaneous. 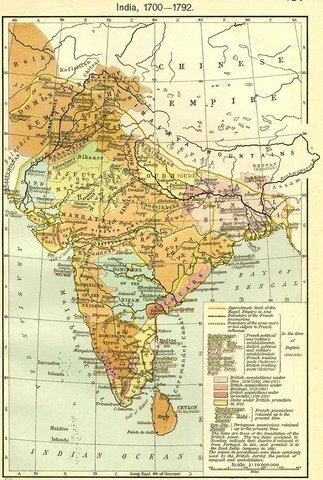 North India is early 17th century and South India late 17th or even early 18th century*. The South India map is a lot more accurate than the North India one. 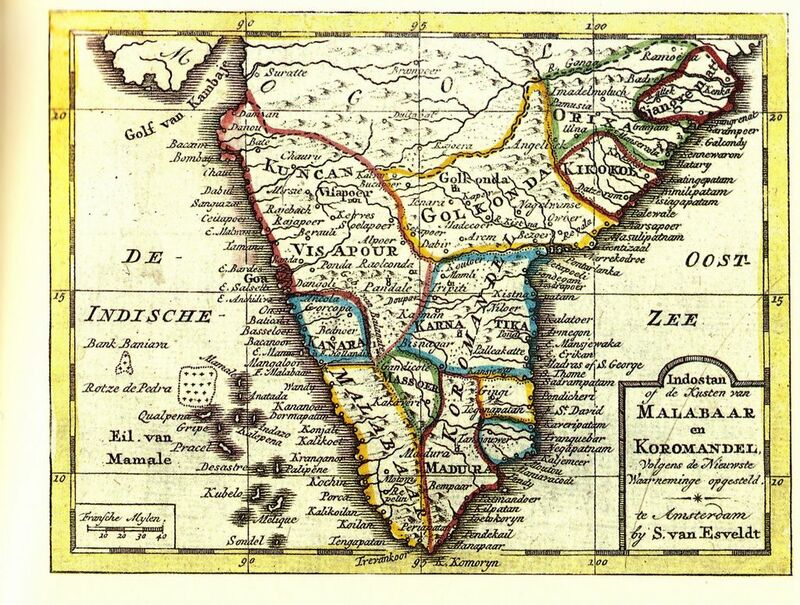 What I find intriguing is the importance given to the Laccadives in the South India map. The islands are completely out of scale. *Fort St. David was founded in 1690. I had to look that up. I had thought it had been earlier.